For over five decades Pivot Point has been a leader in beauty education. Pivot Point is committed to providing world class education and fostering rich educational experiences for everyone from hair designers to estheticians, to competition stylists and those who go on to educate future professionals around the world. Pivot Point is located in over 74 counties. 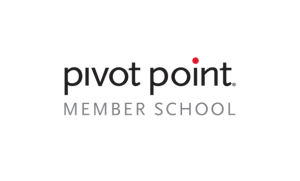 Beau Monde Academy is honored to be the only Pivot Point Member School in the greater Portland Metro area. Click here to learn more about Pivot Point. Our Cosmetology and Esthetics students receive a MUD Makeup Kit as well as the Beauty Essentials MUD Course. This program is designed to give students the basic fundamental skills needed to launch their career as a makeup artist. The course includes learning facial analysis, base matching and application, contours and highlighting, eyes, and lips. The course ends with complete makeup application ranging from one hundred percent corrective to natural makeup. After graduation from Beau Monde Academy and completing the MUD Beauty Essentials course (84 hours of training) students have the opportunity to continue their makeup education at a MUD Studio. All continuing education classes require Beauty Essentials as a prerequisite. Classes available include: Airbrush, Bridal, High Fashion Trends, and more. Click here to learn more about MUD. We strongly believe the products we provide for our students should prepare them for a successful career in the beauty industry. Hence, why we carry Demalogica for our skin care line. 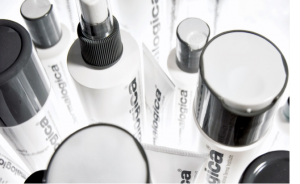 Demalogica is the leading choice of skin care line amongst professionals worldwide! Click here to learn more about Dermalogica. Our nail care line of choice is OPI. Founded in 1981, OPI started with only 30 polishes. Today, OPI fills an average of 150,000 bottles of nail lacquer every day. OPI is the industry staple and first to mind in the nail technology industry. Click here to learn more about OPI. Beau Monde Academy is not a product driven school, but that does not mean we do not carry one of the best product lines in the world. Beau Monde Academy is the only Wella Signature School in the state of Oregon. Click here to learn more about Wella. Sebastian Professional falls under the Wella umbrella. Think of it as Wella’s edgy sibling. Sebastian’s philosophy is “Limitless Self Expression.” Sebastian encourages stylist to think outside the box and supports stylists by providing amazing hair care products. Click here to learn more about Sebastian Professional. Nioxin is also a part of the Wella family, specializing in healthy scalp and hair growth. Nioxin is the number one selling salon brand for thicker, fuller looking hair. Click here to learn more about Nioxin.